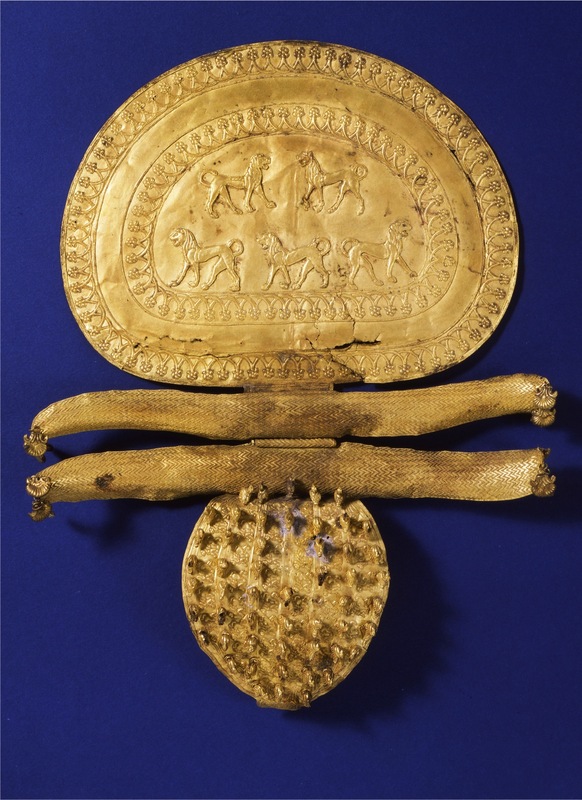 One of the top pieces from the Regolini-Galassi tomb is the large golden fibula that was found in the cella, where the princess was buried. 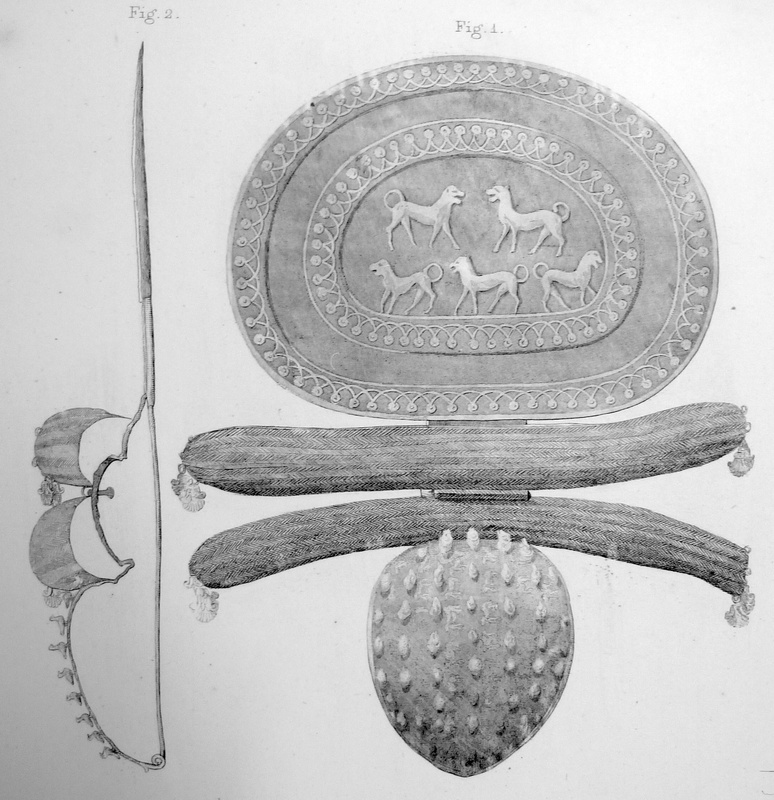 One part of the object is decorated by lions, so we can assume that this part should be the top of the object. The middle part is decorated with zigzag lines, the universal symbol (and hieroglyph) for water. The bottom part looks at first sight like a pond full of ducks. Behind this bottom part, there is a needle to fasten the fibula. 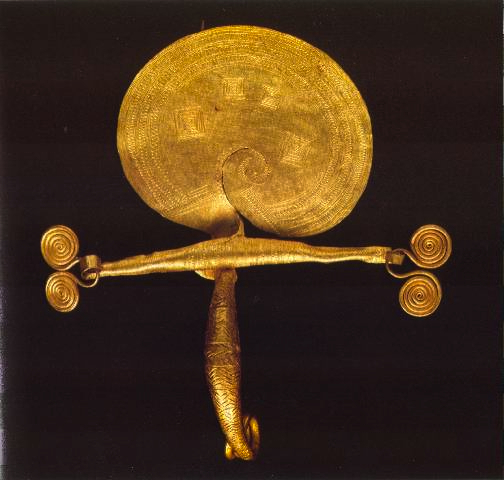 This object from the Regolini-Galassi tomb has been dated 675-650 BC. Since the excavation, several theories have been developed on how this fibula was used. 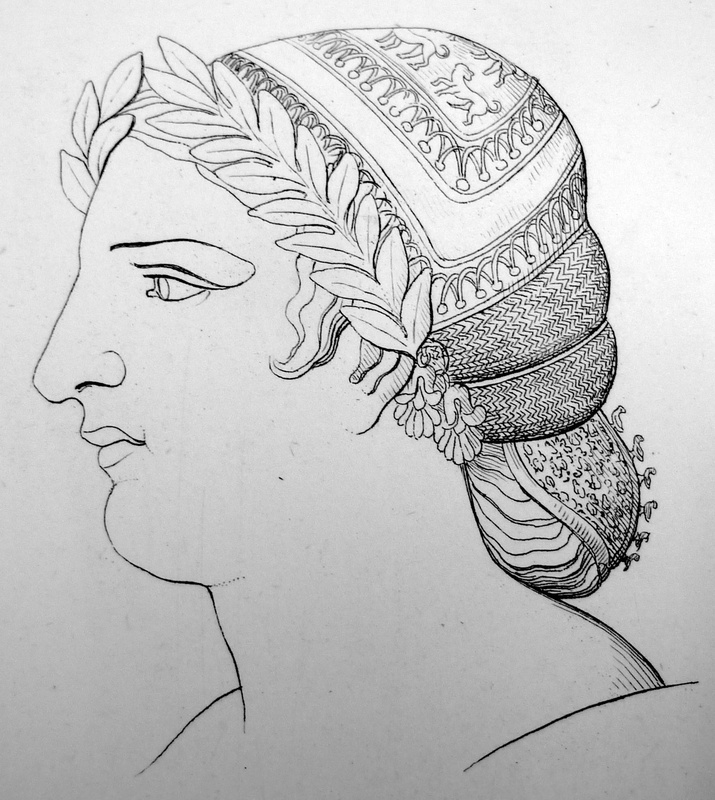 Canina proposed in his 1846 publication that the object would cover the back of the head (see image below). Canina probaby relies on the observation by the excavators that the fibula was found where the head of the deceased was supposed to be. However, this kind of use is quite impossible as none of the parts of the object are made in a flexible material. The reason for such an error probably lies in the fact that, after the excavation, most of the objects were locked up in a room in the house of Galassi, a high official in the papal army, before selling them to the Vatican. It looks like the researchers did not have any access to the objects in the first years after the excavations, creating many misinterpretations and confusion. 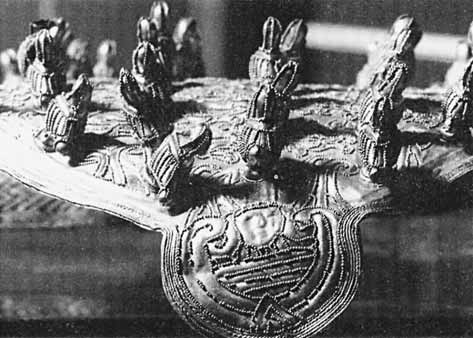 Pinza proposed around 1910 another interpretation that showed the fibula as a large decorative element to close a cape, together with all other elements that had been found (jewelry, golden leaf decorations, bronze elements that were interpreted as part of a throne, a silver cup, …). This proposed use of fibula is quite unrealistic. Not only is the fibula way too big and is the decoration of the fibula tilted over 90 degrees, the object itself is far too fragile to be used in practical life due to the ultrafine gold granulation. Current research however attaches a more funeral meaning to the object. When searching for other similar fibulae, at least two other objects are known today, that not only look very alike in shape and structure but seem also to contain the same symbolic elements. The first object has been found at the Ponte Sodo necropolis at Vulci and has a very similar dating as the previous object (675-650 BC). It is currently at the Staatliche Antikensammlungen in München. 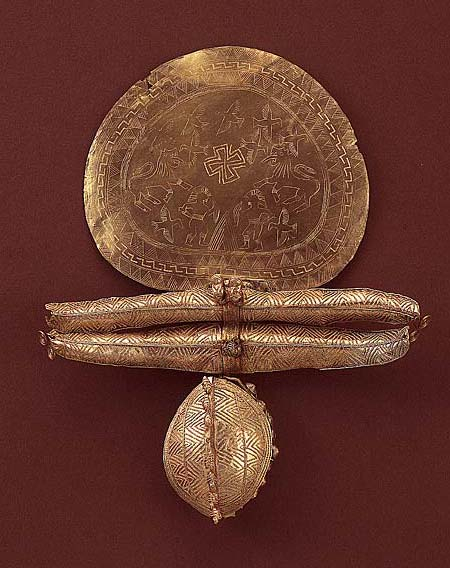 We see a very similar structure and decoration, and it is a bit smaller than the RG disc fibula. The upper disk contains depictions of animals, people and probably the sun. The horizontal elements end in hangers in the form of a double spiral. The second object is older (dated 825-775 BC) and smaller, with a possible provenance from Etruria. It is currently in the British Museum in London. Again, the simularity in shape, structure and decoration (note for example the water pattern and the double spiral hangers) is striking. Maurizio Sannibale has written several excellent papers on the symbolism of these objects, but in short, all three objects seem to depict the transition from the world (the upper disc) to the underworld (the lower part) over the river that separates both. All three objects have also a similar physical structure, with the needle of the fibula behind the bottom part, leaving the top part free-standing. The top part of all three fibulas is flat, while the bottom part is curved. All this brings us to believe that such a fibula must have played an important role in the funeral rites and burials in Etruscan culture. As many small fibulae have been found in the RG tomb, we believe that the deceased princess was wrapped in a shroud. 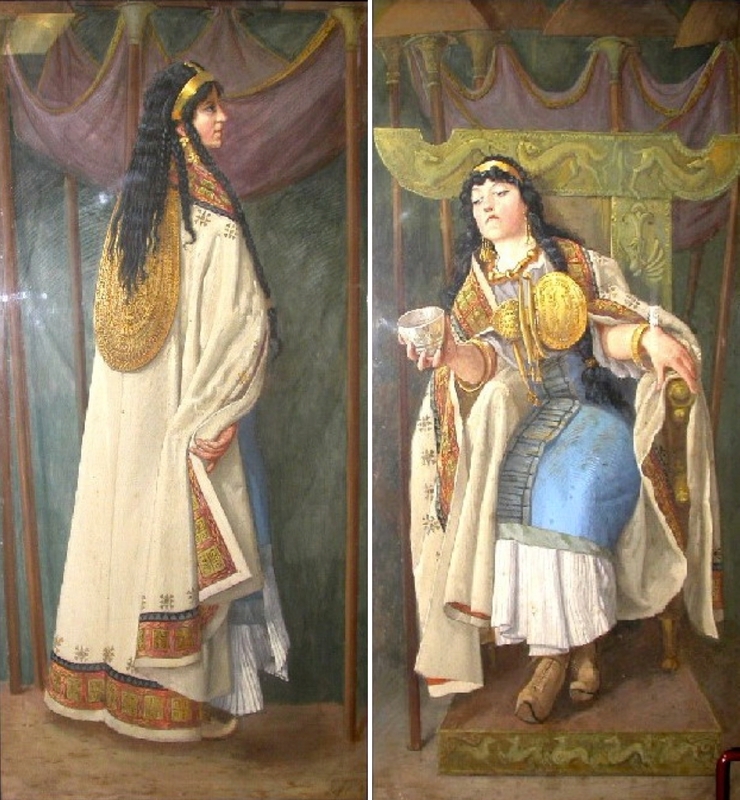 The fibulae were used to fasten the shroud around the body. We think that the pin of the large disc fibula was used to fasten it on the shroud at the forehead of the deceased (see image below). In this way, the freestanding disc would protrude above the head while the curved bottom part would sit over the nose and end at the mouth of the deceased. It is remarkable that the bottom part of the fibula ends in an image of Hathor (see image below), which would sit on the lips of the deceased (see image above), which could have a symbolic significance (Hathor is the Egyptian goddess of love, fertility and transition to the afterlife). Please note that the bottom part of all three fibulae mentioned above are slightly assymetric so that the pin can pass next to the nose of the deceased. When trying to find some iconography that more or less supports this idea, we came immediately to the depiction of Egyptian deities, such as for example Hathor. She wears the sun disk on top of two cow horns on the head. Although the larger disk of the fibula seems to depict the living world and not the sun, the position of the fibula on the deceased looks very similar to the symbols that crown the head of Egyptian gods. Please give your feedback on this hypothesis. If you think it is plausible and compatible with all other knowledge we have about Etruscan funeral practice, we will proceed in creating this in 3D, to be shown in the exhibition in the RMO. This blog is part of the Etruscanning project, that is been funded with support from the European Commission. This blog reflects the views only of the author, and the Commission cannot be held responsible for any use which may be made of the information contained therein. I’m interested in researching the subject of disc fibulae further. Would it be possible to have the bibliography for this article? many thanks for your interest in the subject, I hope this blog is useful for you and that you like the range of subjects that we try to cover in our virtual reconstruction effort. I’ll send you some bilbliography that discusses the meaning of these fibulae (which I also will add in an update of this blog entry), but most of the article is an observation I recently made, which is still unpublished and to my opinion still needs further research by the community, and I’m very happy that you intend to do that. didn’t you receive two emails from me (on your gmail address), already some time ago? If not, please let me know ! I just checked my spam and found it! I wish I could express how appreciative I am! Great! I will make a blog entry on the observation in the Bologna museum that I have sent, so that it can be shared with everybody.